For other uses, see Romeo (disambiguation). Romeo Montague is the male protagonist of William Shakespeare's tragedy, The Tragedy of Romeo and Juliet. The son of Lord Montague and his wife, Lady Montague, he secretly loves and marries Juliet, a member of the rival House of Capulet, through a priest named Friar Laurence. Forced into exile after slaying Juliet's cousin, Tybalt, in a duel, Romeo commits suicide upon hearing falsely of Juliet's death. The character's origins can be traced as far back as Pyramus, who appears in Ovid's Metamorphoses, but the first modern incarnation of Romeo is Mariotto in the 33rd of Masuccio Salernitano's Il Novellino (1476). This story was reworked in 1524 by Luigi da Porto as Giulietta e Romeo (published posthumously in 1531). Da Porto named the character Romeo Montecchi and his storyline is near-identical to Shakespeare's adaptation. Since no 16th-century direct English translation of Giulietta e Romeo is known, Shakespeare's main source is thought to be Arthur Brooke's English verse translation of a French translation of a 1554 adaptation by Matteo Bandello. Although both Salernitano and da Porto claimed that their stories had historical basis, there is little evidence that this is the case. Romeo, an only child like Juliet, is one of the most important characters of the play, and has a consistent presence throughout it. His role as an idealistic lover has led the word "Romeo" to become a synonym for a passionate male lover in various languages. Although often treated as such, it is not clear that "Montague" is a surname in the modern sense. The earliest tale bearing a resemblance to Shakespeare's Romeo and Juliet is Xenophon of Ephesus' Ephesiaca, whose hero is a Habrocomes. The character of Romeo is also similar to that of Pyramus in Ovid's Metamorphoses, a youth who is unable to meet the object of his affection due to an ancient family quarrel, and later kills himself due to mistakenly believing her to have been dead. Although it is unlikely that Shakespeare directly borrowed from Ovid while writing Romeo and Juliet, the story was likely an influence on the Italian writers whom the playwright was greatly indebted to. 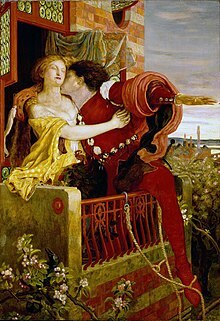 The two sources which Shakespeare most likely consulted are Brooke's translation of de Porta and William Painter's The goodly historye of the true, and constant Love between Romeo and Juliet. ^ da Porto, Luigi (1868). "The Original Story of Romeo and Juliet". In Pace-Sanfelice, G. The original story of Romeo and Juliet by Luigi da Porto. From which Shakespeare evidently drew the subject of his drama. Being the Italian text of 1530, and an English translation, together with a critical preface, historical and bibliographical notes and illustrations. Translated by Pace-Sanfelice, G. Cambridge: Deighton, Bell, and co. hdl:2027/mdp.39015082232961. ^ Hunter, Lynette; Lichfield, Peter (2009). Negotiating Shakespeare's language in Romeo and Juliet: reading strategies from criticism, editing and the theatre. Farnham, England: Ashgate Publishing. p. 93. ISBN 978-0-7546-5844-3. ^ Halio, Jay (1998). Romeo and Juliet: A Guide to the Play. Hoboken, New Jersey: Blackwell Publishing. p. 93. ISBN 1-4051-1396-0. ^ Bevington, David M. (2006). How to read a Shakespeare play. Westport, Connecticut: Greenwood Press. p. 37. ISBN 0-313-30089-5. Shakespeare, William (1859). Romeo and Juliet:A tragedy. Leipzig: G. Græbner.